Hey, Im sure you know this form this project, but what are the pin outs of the cable. Im modding a macbook into a desktop and Im just using the small ribbon wire. Any idea of the pinouts? Hi Nick, thanks for stopping by. Sorry I don’t know the pin out on the flex cable. If you have a multimeter with ‘continuity test’ mode (the one that beeps when you short the two probes), you should be able to work it out quite easily. Good luck because the flex cable is really really small. I love it. I’m going to follow your lead as I can pick up a top case for $30 on eBay. What did you use to cut the case? 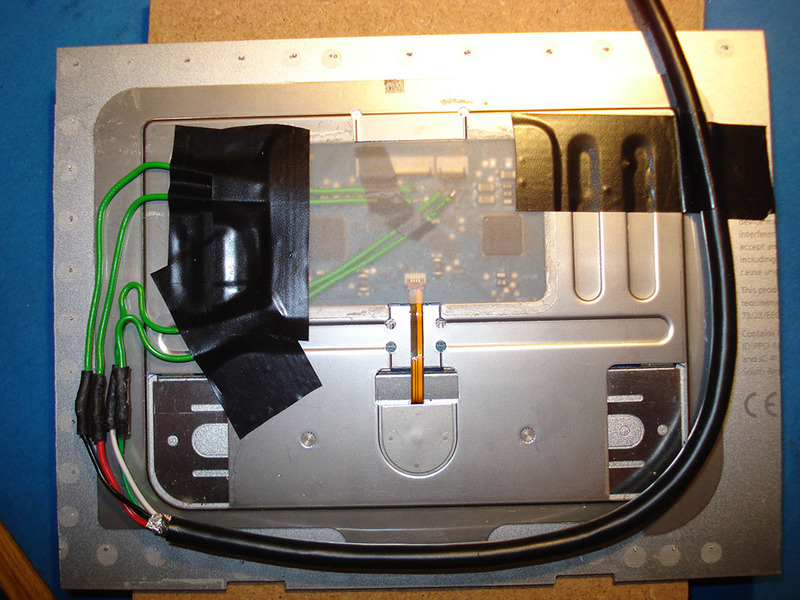 Hello Justin, I simply used a vice and a junior hacksaw to cut the trackpad out of the top case. 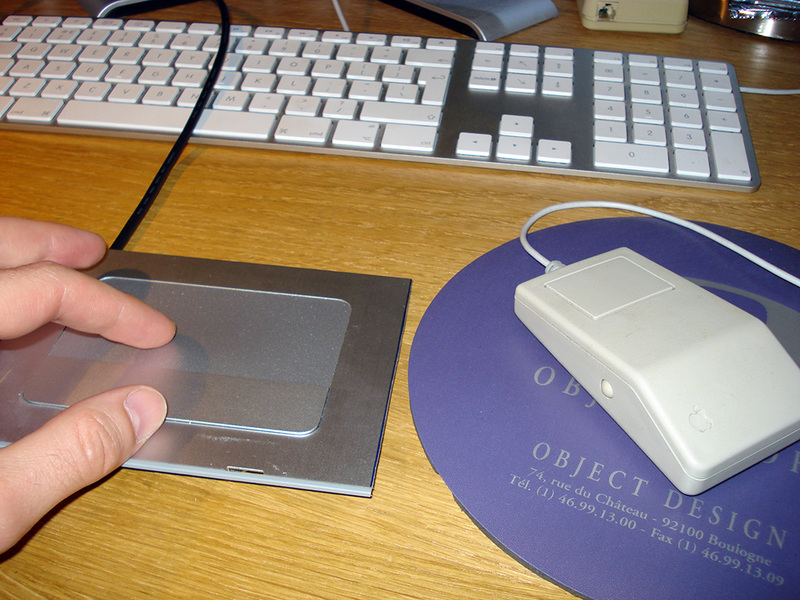 Macbook trackpad. I’m wondering how you identified the correct test points to use? On the newer trackpad, everything is just labeled TP1, TP2, TP3, etc with about 17 test points on the board/ribbon cable. The ground point will be directly connected to the ‘ground’ path of the board (the continuous/large path that is spread all over the board). The +5V point should be coming off a ‘thicker path’. 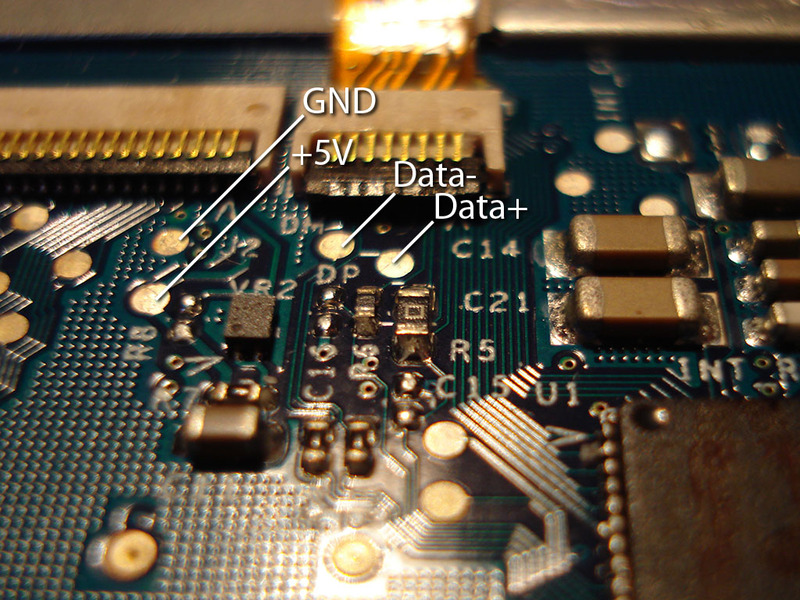 The data + and data – wires will be very likely to be next to each other on the flex, you can track them from there, or try to locate the USB controller chip and find its datasheet and workout the D+ and D- circuit from the chip itself. 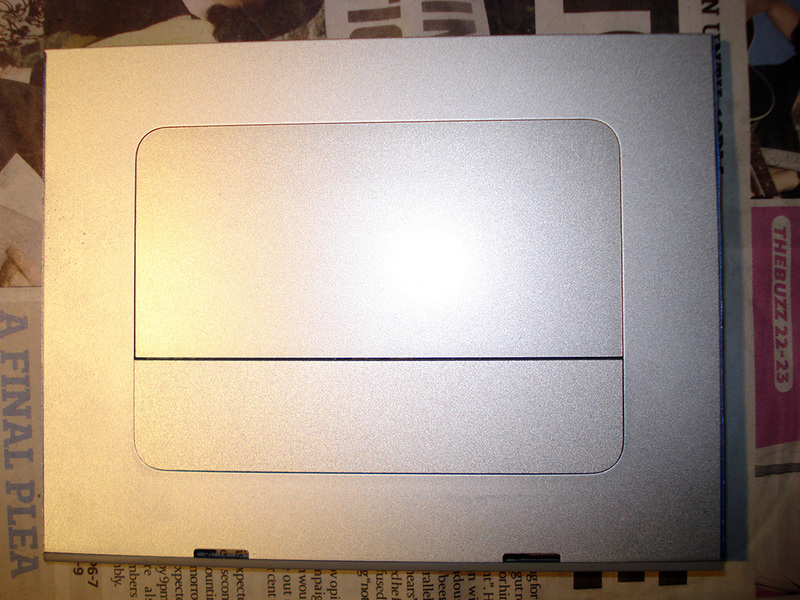 just wondering if anyone worked out the pin out for the macbook (pre-unibody) trackpads? Hi Ray, I believe the trackpad I moded comes from second generation (core 2 duo) macbook pro, which is pre-unibody. In short, it’s not possible with just the touchpad, as the mouse USB controller is on the logic board, and not located on the touchpad’s PCB, like the older pads. I managed to get a hold of someone at Apple who answered my questions and confirmed this as well. Thanks a bunch for the detail. I had hoped that the broadcom chip also did USB communication, but I couldn’t find any real detail on the chip. Hey, any possible way you would be able to figure it out with a slightly newer pre aluminum mb pro? The boards seem similar, but i definitely dont see test points or anything. There is a picture of my board. lmao, sorry about the low res before… used my camera phone… couldnt tell til after i posted it… the links above should be much higher res. I have tested the factory test points. The three that are closest to the terminal in a line should be D-, D+, and 5v. The GND seems to go off to C2 and C3 near the square chip. Here is what I [think] should be the correct USB pinout for the macbook top case. 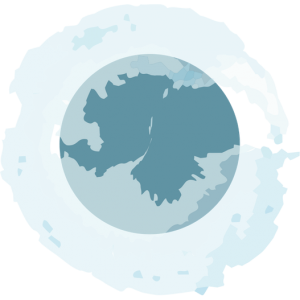 I will try to test it this week. I have soldered to the points I mentioned, and it WORKS! Fantastic repurposing for these devices! Jeff your picture is gone? 🙂 Would you guys mind pointing out the pins for the Macbook trackpaD? it looks different than macbook pro..
And actually i was planning to connect the flex connector to USB but i am afraid of burning the chip by accident. Could i possibly test with a multimeter? What should I look for in the multimeter? The only thing you can really check with a multimeter as far as I know is if what you think is the ground test point really is (because it will should be connected to the ‘shield’ path (all the really thick tracks)). do anyone did find the connector pinout? jeff can you put your image back plz? dogan, did you actually make it work connecting the flex connector? if so, can you give some information about your connection? I think it’s easier to de-solder the connector on the ribbon cable and use some wire-wrapping wire to connect to the points. Also, this will work on any model MacBook of that case design. I used to be an apple repair tech and we would regularly switch out models of top case — the design of the trackpad might change but the cable remains the same. oops, forgot to mention, i’m using a macbook top case, not a macbook pro one… same rules apply, in fact you can actually use a macbook cable to plug into the macbook pro trackpad (they are the same). The macbook pro cable just includes some extras like bluetooth and some sensors. one last question, if you were a apple repair tech, do you think i can wash my topcase in hot water and let it dry for a week? will it work after that? Do you think i can wash my topcase in hot water and let it dry for a week? I’m looking to turn an old MacBook Unibody Model A1278 into an external USB keyboard / trackpad (similar to the one shown here: http://www.youtube.com/watch?v=FueCMR-3G8Q). Can anyone help me identify the GND, D-, D+, 5v pins necessary to do this? 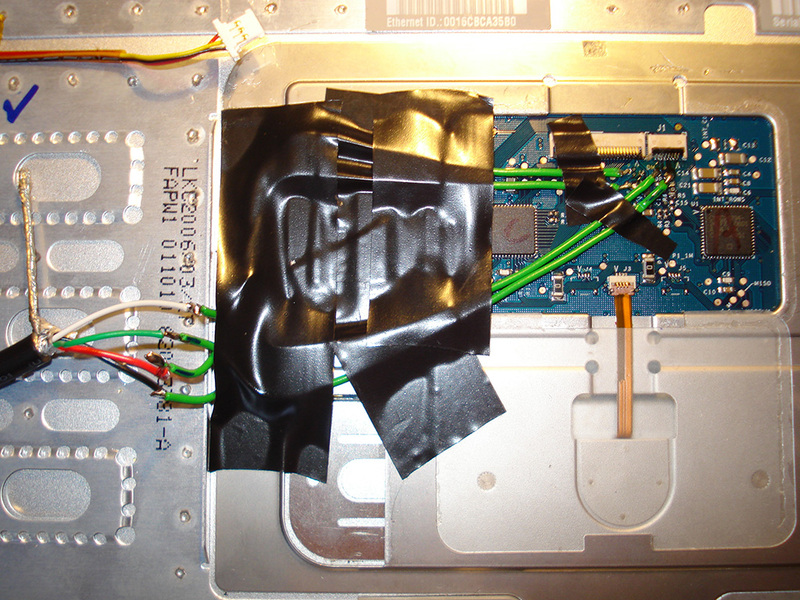 As mentioned above, http://www.ifixit.com/Teardown/MacBook-Unibody-Model-A1278-Teardown/589/1 has a breakdown. Any help or suggestions will be much appreciated. thats why i want to use some hot water. @bobledob: Definitely don’t use water… the problem is that it won’t be able to dry easily with all the layers in the keyboard, and there’s no easy way to take it apart. @McKean: You might be in for an uphill battle with the unibody case conversion. The problem with that is the keyboard plugs directly into the motherboard and doesn’t use the trackpad for USB conversion like the older ones do. I remember the cable looked pretty similar, so maybe you could use a trackpad from one of the older MacBooks to hook up to the keyboard, but that’s a really big stretch… chances are the keymappings wouldn’t be right. You *might* be able to use the trackpad, but I kind of doubt it’s straightforward USB, there are over a dozen pins on the connector it uses, plus, there’s some hardware in the cable itself if memory serves, not sure what it’s purpose is. who i was searching the internet for a usb touchpad simular to apple . and only found the wacom bamboo touch but after reading reviews i find out its not as good as the mac book touch pad . 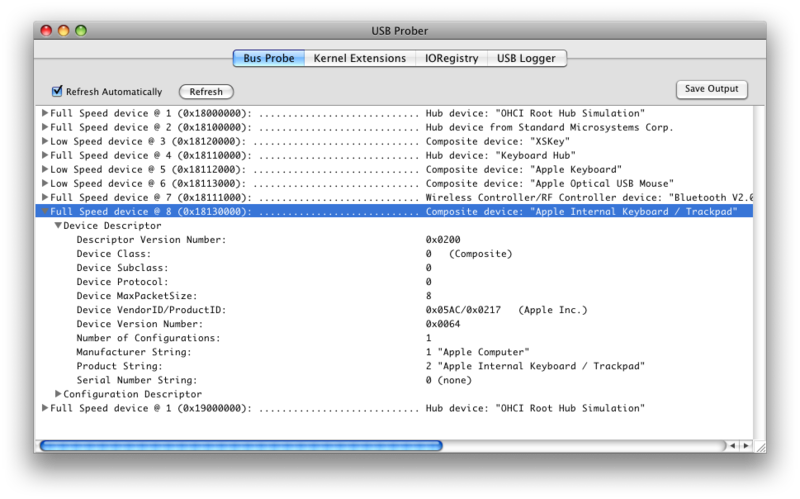 so i checked system profiler and saw that the touch pad was connected to usb controller. then google brought me to this page. this is great am now going source a touchpad and and case that i can fit it in. on thing any one knows if the all in one touch( that doesn’t has the button at bottom ) pad thats in the macbook pro is the same pin out. Would any one be able to provide some help for the same mod on a 17″ 2.5GHz model multi touch trackpad. If the test points are too difficult, would it be possible for someone to show me what the pinouts are for the ribbon cable that plugs into the trackpad board? I think only four of the 8 pin cable are actually wired to the trackpad board. I can go from there and test which test point each channel on the ribbon cable leads to. i just solder a usb cable to a macbook topcase cable, they are really small, but look good. i try it on my mac and nothing, the keyboard and trackpad don’t work. because the pc recognize it, i think my solder are good, but why don’t it work on my mac? thanks for this tip! I successfully done it using a macbook 13′ topcase. It’s work both on mac and pc with no aditionnal driver. The pcb wiring is a little bit different but thanks to tony cable pinout I managed to find testing points. I want to use it on my macbook who have a broken topcase connector (it just recognizes the power button, and I tried several topcase with no luck). Does anyone can help me to find an internal usb on the logical board? Hey Jeff, what was that you said about selling these? Is that for real? How much? hi . Does someone know how to turn leds on that keyboard. some application or wires ? Thank you Bounav and tony for your insight. Do you know if the macbook air’s touchpad has the usb controler on it like the preunibody macbooks? I would like to mod my laptop to get multitouch. I first looked at the wacom bamboo but it’s too big. The touchpad of a macbook might just be perfect for my hackintosh and I like the idea of patching my pc with a mac 🙂 . I found the answer to my question, I think. Thanks a lot for your brilliant insight bounav! I’d love to see a converted unibody too, but it sounds like it won’t happen. hem… now anyone got some multitouch drivers for Windows? Looks to me like a very complicated one… Any guidance? Does not look like any of the ones posted above… Please can someone help?